This month has a selection of 3 cases with a similar theme – that of vascular trauma after blunt intracranial injury. Given the relative rarity of the condition, it is not an area that many of us know much about, so diagnosis is often delayed and management is uncertain. The consequences, however, can be morbid. These recent cases we had in the last few months illustrate some of the vascular injuries that can be sustained in pediatric blunt head trauma. A 4 year old girl presented with a head injury sustained when a heavy motor gate fell on her. She sustained a middle cranial fossa base of skull fracture clinically and had CSF otorrhea on the right. She was full conscious and had no neurological deficits. Head CT scan showed a fracture that ran across the length of the petrous ridge, crossing the carotid canal and onto the body of the sphenoid bone (Figure 1 A). Despite the lack of neurological signs, we were concerned about injury to the carotid artery given the proximity of the fracture, so we proceeded to an MRI examination. MRI showed complete absence of filling of the right internal carotid (Figure 1 B) and thrombus that extended to the origin of the vessel in the neck (Figure 2 A). Fortunately, flow through the Circle of Willis was sufficient and no ischemia was demonstrable on DWI. Figure 1: A, Head CT bone windows showing the fracture across the body of the sphenoid. B, MRA source images showing the missing carotid on the right. Figure 2: A, MRA showing the missing right ICA, with reconstitution of flow through the right MCA and ACA from crossflow through the Circle of Willis. B, MRA of the neck vessels showing occlusion of the right internal carotid at its origin. Fortunately the patient did not develop a hemiparesis due to the good cross flow. We debated the value of aspirin and decided to hold off during the acute phase of trauma. At 2 weeks after injury she remained well and we decided to put her on low dose aspirin. The debate at this time was that if she had not developed ischemia then this would unlikely develop even without aspirin. On the balance of risks we decided in favour of aspirin though. We repeated the MRI at 6 weeks, at which time it looked much the same. Currently, the child remains well and we intend repeating the scan again in 3 months. A 6 year old boy fell from his bicycle and sustained a head injury with temporary loss of consciousness. When he was seen in the trauma unit, he had recovered fully and had a normal neurological examination. Head CT scan showed a right sided linear parieto-temporal fracture and possibly some diastasis of the lambdoid suture, but the brain appeared normal (Figure 3 A+B). Figure 3: A, Head CT reconstruction showing linear parieto-temporal linear fracture and mild diastasis of the right lambdoid suture. B, Initial brain CT scan showing normal findings. The child was well and there were no concerns about the brain CT, so he was discharged with a head injury form. About 2 weeks after the head injury, the child was brought back to the hospital. Now, he had developed bilateral 6th nerve palsies, had bilateral papilledema, and had massively increased scalp swelling over the whole cranium. Repeat brain CT scan was largely unchanged, so we considered possible venous obstruction that would potentially explain all 3 phenomena. MRV showed bilaterally occluded transverse sinuses. Posterior flattening of the globes was consistent with the apperance of papilledema. We placed the child on Clexane and waited. Figure 4: A, MRV 2 weeks after injury at second presentation, showing bilaterally occluded transverse sinuses. B, Sagittal T2 MRI demonstrating the scalp swelling. Figure 5: A, T2 MRI showing the posterior flattening of the globes bilaterally. B, Axial MRI showing thrombus in the right sigmoid sinus. Over the next few weeks the child progressively improved. At 4 weeks after his 2nd presentation, his 6th nerve palsies and papilledema had resolved, as had his scalp swelling. Repeat MRV showed progresisve improvement in flow through the transverse sinuses, especially on the right. Currently he remains well and awaits another MRI at 3 months. A 4 year old girl sustained a severe head injury as passenger in a motor vehicle accident. Her mother died in the accident and her sister was also admitted with a severe head injury. The child was admitted with a Glasgow Coma Score of 4/15, a left hemiparesis and right fixed, dilated pupil. Head CT showed a severe injury to the brain (Figure 7 A): there was a right acute subdural hematoma, multiple small contusions, subarachnoid hemorrhage, and a diffusely dark appearance to the brain, especially the right hemisphere. There were no base of skull fractures evident. 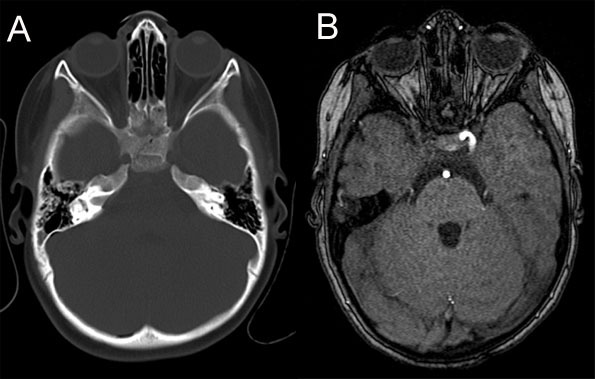 Figure 7: A, Initial head CT scan demonstrating the severe injury, acute SDH, and somewhat darkened brain. B, Head CT bony windows, there was no BOS# evident. The patient was managed in the pediatric ICU with standard neurotrauma management, which at our institution included ICP and brain oxygen monitoring. ICP was high and brain oxygenation was low, requiring frequent interventions. Eventually, the acute process settled, the monitors were removed and the patient was extubated. The GCS remained low at this point but the child was slowly improving and stable off ventilation. On Day 15 after post-trauma, however, there was a sudden deterioration in the child’s neurological condition. Emergent head CT showed an acute intraventricular hemorrhage and hydrocephalus (Figure 8A). An external ventricular drain was placed, the patient was returned to the ICU and an MRI was obtained. MRA showed a complex dissection involving the right ICA, right MCA and right A1 (Figure 8B and Figure 9A). Unfortunately, this bled again 3 days later – the patient deteriorated further and repeat imaging showed a new large parenchymal hemorrhage with brain swelling and midline shift. The child’s GCS was now 3/15 and both pupils were fixed and dilated. 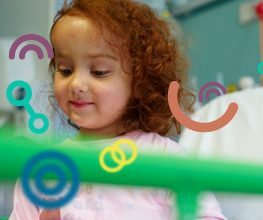 Given the poor clinical condition and devastating appearance of the imaging, we did not feel that active intervention would lead to a good outcome in this child so we took the decision to de-escalate treatment. Despite this, the child survived but in a very poor neurological state. Figure 8: A, Day 15 – Head CT after acute deterioration. there has been a large intraventricular hemorrhage and hydrocephalus has developed. B, MRA showed a complex arterial dissection leading to occlusion of the right MCA and A1. Figure 9: A, A-P view of MRA showing the right MCA and A1 occlusion. B, Day 18 – Now a massive hemorrhage has occurred with a substantial parenchymal clot, raised pressure and midline shift. These cases are not meant to be a comprehensive summary of vascular injury after blunt head trauma, but rather a reminder of the risk to intracranial vasculature, even after what appears to be minor head trauma. Sometimes these involve fractures of the vault or base of skull. In fact, we have had a couple of patients who sustained severe anterior base of skull fractures, presented with gross arterial epistaxis and died within a few hours of trauma. Sometimes there are no fractures involved and presumably it is shear effects that cause arterial wall injury and consequent dissection. There are several ways in which arterial and venous structures can be injured in blunt head trauma. A comprehensive description of the spectrum, as well as clear guidelines on how to manage these cases, would be useful. This case of the month was prepared by Ncedile Mankahla, Chris Young, and Tony Figaji of Red Cross Children’s Hospital, Cape Town.